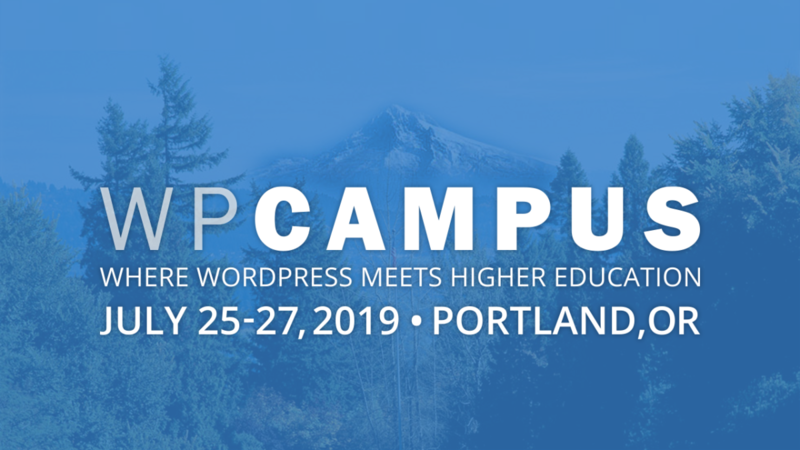 Blog: Announcing WPCampus 2019. Call for Proposals Open! We’re excited to officially announce WPCampus 2019! Join us July 25-27 at Lewis & Clark College in Portland, Oregon. WPCampus is a three-day conference event filled with sessions, networking and social events. It will cover a variety of topics, focused on accessibility and WordPress in higher education. Visit the About page to learn more! This year’s event will take place July 25-27, 2019 at Lewis & Clark College in Portland, Oregon. We’re excited to make it out to the west coast this year! Visit the WPCampus conferences page to learn more about our previous conferences: WPCampus 2016 (in Sarasota, Florida), WPCampus 2017 (in Buffalo, New York), WPCampus 2018 (in St. Louis, Missouri) and our annual virtual conference, WPCampus Online. All WPCampus events and resources are open to faculty, staff, students, and professionals from inside and outside higher education, all over the world. Registration for WPCampus 2019 will open on Monday, April 22, 2019. The cost of general admission is $150 and will cover attendance on July 26-27. If you’re interested in sponsoring the event, we’d love to talk to you! Learn more on our Sponsorship page. WPCampus is looking for stories, how-tos, hypotheticals, demos, case studies and more. Our call for speakers is not limited to those who work in higher ed; you do not have to be in higher education to bring value to our community. At heart, we’re just web folk doing web things. We’d love talks on dev, design, content, strategy, management, being human and whatever else you find valuable to make the web, and higher education, a better place. If you use WordPress in higher ed, we’d love for you to share your work (and brains) with our community. If you need topic inspiration, we have provided a few ideas on our call for speakers.